The use of precast concrete pavement systems to accelerate construction and enhance durability was the focus of a demonstration showcase at a Highways for LIFE project under construction outside the nation's capital in Virginia. Cast off-site and installed rapidly at the construction site when traffic volume is low, precast concrete pavement panels offer several benefits, including faster construction, reduced traffic congestion, fewer roadway closures and more durable pavements. About 85 transportation professionals from highway departments, industry, universities and the Federal Highway Administration attended the showcase to learn how the Virginia Department of Transportation is using this alternative pavement treatment to replace distressed pavement slabs in a high-traffic area of Interstate 66. "One of the greatest obstacles to innovation is that occasionally it has higher up-front costs but longer-term payback," FHWA Deputy Administrator Gregory G. Nadeau told the group. "In an era of constrained resources, it's tough to take that on. But with a technology like this, when you factor in the reduction in time it will take to make that repair to that key piece of congested highway, the payback is much quicker." Through programs such as Highways for LIFE, FHWA is helping highway agencies and industry accelerate innovation implementation, Nadeau said. "If we can deploy technology to the point where we achieve economic critical mass, those up-front costs will come down and you'll achieve overall economic benefits and long-term system benefits for your investment," he said. "This is where the professional community really shines in being able to bring to customers innovations and technology that make a difference in their lives," Virginia Transportation Commissioner David S. Ekern said. "You are providing the best and most cost-effective solutions to the infrastructure problems this country faces." In other presentations, FHWA staff discussed efforts to encourage use of precast concrete pavement systems to expedite construction, and Virginia DOT staff and contractors talked about development of the I-66 project. Industry representatives provided overviews of the types of precast systems available—jointed systems and prestressed, post-tensioned systems—and examples of their use on projects across the country. Showcase participants visited the project site at night to see firsthand the use of precast concrete pavement panels on the 40-year-old exit ramp from I-66 to U.S. 50. They observed the removal of the existing concrete, preparation and grading of the roadway subbase, and preparation and placement of the new pavement slabs. Conventional repair with cast-in-place concrete would require about 100 days with traffic congestion from lane closures, but the precast slab approach allowed closure of one lane at a time for about 35 nights of work and made all lanes available for rush-hour traffic. FHWA Deputy Administrator Gregory Nadeau told showcase participants that using innovation on highway projects can yield economic and system benefits. Heavy traffic in the project area contributed to the agency's decision to try precast concrete pavement systems, said Karen Consiglio, Virginia DOT area construction engineer. "The objective of our project was to try these technologies, do some comparisons and see how everything worked, " she said. FHWA has a long-standing commitment to promoting innovations that can benefit the highway system and its users, said FHWA Associate Administrator King Gee. "As we go into more reconstruction and rehabilitation of our infrastructure, we're going to have to do it faster and with less disruption to traffic, " said Gee. "This technology accomplishes both, and on top of that we get better quality because it's prefabricated off-site in a controlled environment." To view the Virginia showcase presentations, go to http://www.pdshowcase.org/?fof=Y. For a Highways for LIFE Web conference on precast concrete pavement systems, visit www.nhi.fhwa.dot.gov/about/innovationseries.aspx. 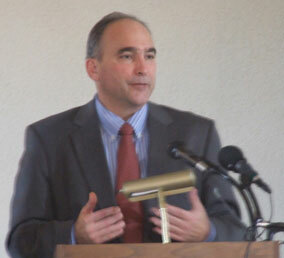 Thomas K. Sorel became Minnesota's transportation commissioner in 2008. 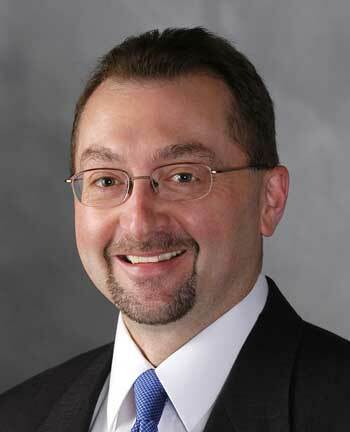 Before that, he spent 30 years with the Federal Highway Administration, including stints as Minnesota Division administrator, stewardship/oversight group and major projects team leader in Washington, D.C., and U.S. Department of Transportation intermodal liaison for the 2002 Winter Olympic Games. He spoke with Innovator about using innovation and marketing to enhance a state transportation agency's success. Why is now such a critical time for the highway community to innovate? If there ever was a time to look at innovation, now is that time. We just published our transportation plan, and we identified a $50 billion funding gap over a 20-year period. I'm asked all the time how we're going to close that gap. Recently, I did a media event at which I was asked that very question. I said we've got to look at different kinds of funding mechanisms, and innovation goes hand in hand with that. If we can be innovative in areas like contracting, financing, new materials and congestion mitigation techniques, I think we can close that gap. What progress do you see the highway community making in becoming more innovative? For many years we didn't have the funding challenges we have today, so there wasn't strong motivation to look at innovative practices. But that's changing. When you look at transportation organizations today, you see that organizational structures and skill sets are changing to reflect an innovative approach. But it's not something that can happen overnight. Because they have been around for a long time, many transportation organizations are big ships to move. It's just the nature of our business. I think the key to moving forward is respecting the past. I say that over and over again here in Minnesota. If we can respect the past and the people who have done a great job getting us to where we are today, then change and innovation become more acceptable. You don't want to discount the past because a lot of creative and innovative people preceded us. Why did you launch a new Minnesota DOT office—Policy Analysis, Research and Innovation—with innovation as a key responsibility? Shortly after I got here, I decided we needed a strategic vision that reflects the future. A key element of that vision is innovation. We've identified it as one of the strategic directions of the department. I felt we needed some element of the organization that could support that, so we created this office as the focal point for jump-starting innovation. That doesn't mean innovation is not occurring throughout the department, but this office helps us create an innovative culture. The other thing we did within that office was create an external partnering group to work on relationships with the stakeholders Mn/DOT deals with, such as city and county officials, contractors and consultants. Within that group we established a marketing component that serves as a focal point for external marketing for the department. How important is marketing to your agency's success? I am a big believer in marketing and always have been, so when I came to Mn/DOT I wanted to see that we had the marketing element the organization needs. We've always had marketing research activities and good marketing in certain areas, such as our snow and ice control area. I wanted to expand that. We have since been using marketing and market research for other things, such as our urban partnership agreements. We've been using marketing techniques in discussions we're having on rail and on our TIGER [Transportation Investment Generating Economic Recovery] grant applications. I see a big role for marketing in gaining an understanding of public values and being responsive to public needs. We're now developing a marketing plan for the entire department. We're ratcheting up what we've done in the past and trying to develop a mindset of thinking like marketers. It's something I talk about to employees all the time. It's not just the marketing staff who's responsible. We're all responsible. We need to understand what our customers value and what kinds of services they're looking for. What did you learn from Minnesota's Highways for LIFE project, which used full road closure in rebuilding Highway 36 in North St. Paul? We learned how effective marketing can be. There were a lot of early discussions about using full closure, and we thought people would be very uncomfortable with that. But our market research told us we could turn that around if we did it right, so it really highlighted the importance of market research. It was our first full closure in an urban environment. Now we think about it as we're developing other projects. It's clearly a possibility when before it was a no-no; we could never do that. I think that's a very positive thing. Beyond that, we're starting a program called Destination Innovation. We're taking $30 million and we're going to use it to fund innovative ideas. We're modeling the program after Highways for LIFE. When I was with FHWA, I always thought a lot of the program. I saw what it did nationally and I wanted to bring that idea to Minnesota. We're going to ask folks to bring ideas for innovation to the table and seek funding from the program that can be matched from another source, similar to Highways for LIFE. What else are you doing to jump-start innovation? There is one thing we're in the middle of now that I'm pretty excited about. Several years ago, I was looking at how private sector organizations stimulate innovation. I came across an IBM program called Innovation Jam. They pick a topic, and for several days people get online and throw out ideas. Other people join the conversation, and they just keep building on it. In the end, they have some new and innovative ideas for products and services. When I came to Mn/DOT, I thought, "Why can't we do something like that?" So as we speak we're in the middle of an E-magination Jam. It's going on online for this entire week. Employees are throwing out ideas and then jamming on these ideas. If you don't have an idea, you go online and vote for other people's ideas. We're trying to focus employees on our strategic directions—safety, mobility, innovation, leadership and transparency. So the ideas they put up there should fit into one of those strategic directions. But they have the capability of throwing anything up there. It has been a really creative process. We've set aside a little bit of the Destination Innovation fund to fund some of the ideas, and we'll fund other ideas other ways. One of your goals when you started as commissioner was to rebuild public trust in the agency after the Interstate 35 bridge collapse. Did you have other goals in mind? When I came here I had four things I told the governor I wanted to accomplish. After the bridge collapse, Mn/DOT was kind of a beleaguered agency. It took a lot of unfair criticism from the media. A prime focus of mine was to be a champion of the great Mn/DOT workforce, both internally and with external partners. Second was rebuilding public trust and confidence in Mn/DOT. Building the new bridge was a key element of that. It was a healing process to build the bridge and get it up in a way that the public saw as very transparent. We worked hard to do that, to get all of the information we had out there, and to explain our decisions. Third, I wanted to help Mn/DOT become a national leader again and be active in the national scene. If you don't do that you become isolated in your thinking. You've got to get out there and learn from others. On the other hand, we are all public servants and we have a responsibility to share what we know. And lastly, I wanted the department to become more transparent and accountable. Those are the four things I wanted to accomplish. To view the Minnesota DOT's strategic vision, go to http://www.dot.state.mn.us/vision/index.html. For details on Minnesota's Highways for LIFE project, see "Full Road Closure Speeds Minnesota Project" at www.fhwa.dot.gov/innovation/innovator/issue03/index.cfm#a7. A group cross-cutting session on "Nothing but Net: The Results of Applying Highways for LIFE Concepts to Highway Construction Projects" will cover how innovations were deployed to build projects in several states faster, more safely, less expensively and with less impact on motorists. It's scheduled for 10:15 a.m. to 12 noon on Jan. 13. A workshop on "Innovations in Project Delivery and Performance Measurement: Highways for LIFE," 8 a.m. to 12 noon on Jan. 14, will highlight lessons learned from the program and provide an idea exchange on rapid deployment of proven innovations. Presentations will include accelerated construction innovations, performance goals, user satisfaction, traffic operations and work zone management, and project case studies. Highways for LIFE displays in the exhibit hall will feature the initiative's latest vanguard technology, the safety edge, as well as information on demonstration projects and the Technology Partnerships program. For more information, go to www.trb.org/AnnualMeeting2010/Public/AnnualMeeting2010.aspx. The contractor building an $8.7 million bridge in Washington, D.C., plans to use prefabricated components to slash construction time to just 10 months—compared to 24 months that cast-in-place methods would require. The District DOT is using prefabricated bridge components to speed reconstruction of the Eastern Avenue Bridge, shown here before the project began. The District Department of Transportation won a $1 million Highways for LIFE grant for innovations on the Eastern Avenue Bridge over Kenilworth Avenue, a major Washington, D.C., traffic artery. Mobilization started in October 2009 and full construction was expected to begin in November, said Vinh Hoang, area engineer for FHWA's District Division. The project meets the Highways for LIFE performance goal of a 50 percent reduction in the time highway users are affected by construction. Based on past experience and a preliminary time analysis, cast-in-place substructure construction would take about three months. That time will be cut to just four to six weeks with prefabricated substructure components. During night operations, the prefabricated superstructure units can be brought to the site and lifted into place. The District DOT expects to close the bridge to traffic for just six months, compared to a year that cast-in-place methods would require. Pier units fabricated and test-fit off-site will decrease the substructure construction time by eliminating the need to transport and assemble significant amounts of reinforcing steel, cast-in-place concrete and form work. Sixteen precast concrete pier units will be erected onto the cast-in-place pier footing and median barrier. The new bridge will be 113 feet (34.4 meters) long by 174 feet (53 meters) wide. Fourteen prefabricated superstructure units each will consist of a 9-foot-wide (2.7-meter-wide) lightweight concrete deck supported by two rolled steel beams. The beam-and-deck units will be constructed at an off-site facility. "Once the prefabricated units are erected adjacent to each other on-site, longitudinal reinforcing will be placed in the hoop reinforcement that extends from the sides of the precast units," said Hoang. The prefab units will be made into an integral deck with closure pours. Because of the width of the bridge, there is a longitudinal joint that requires two modified prefabricated superstructure units to accommodate placing a strip seal. Eastern Avenue will be closed in both directions during night installation of the prefabricated superstructure. Full closure instead of maintaining traffic on the bridge during construction will improve safety for both construction workers and the traveling public because the two will not share the roadway during reconstruction. Another potential source of worker injury is eliminated by using prefabricated components, because cast-in-place construction would require workers to assemble the deck, in-place and over traffic, for a longer time period. The District DOT also will increase enforcement of work zone speed limits. Variable message signs will alert traffic to potential hazards in the work zone. The agency expects to reduce roadway user delays greatly with its maintenance-of-traffic plan, which involves detouring Kenilworth Avenue traffic onto nearby service roads during construction. About 82,800 vehicle-hours of delay per weekday are estimated for the proposed plan versus 19,490 vehicle-hours of average weekday delay for existing conditions. With staged construction and conventional methods, delays would be much longer. That alternative would have left the Eastern Avenue Bridge partially open during construction and would have involved month-long lane closures on Kenilworth Avenue. An estimated 920,900 vehicle-hours of delay per weekday would have resulted from conventional methods–a 4,725 percent increase in delay versus preconstruction conditions. For more information, contact Vinh Hoang at (202) 219-3518 or vinh.hoang@fhwa.dot.gov. What's this, a bridge-building machine? That's just what a joint venture team used to build a bridge over the Pamlico-Tar River Bridge for the North Carolina Department of Transportation. The bridge is part of a $193 million project to design and build a 6.8-mile (10.9-kilometer) Highway 17 bypass around Washington and Chocowinity, N.C. The new bypass splits off west from existing Highway 17, curves south and crosses U.S. 264 and the river. From there it curves east and crosses over mainline U.S. 17, then passes under NC Route 33. A gantry used to build a bridge in an environmentally sensitive area drove piles, placed pier caps and positioned girders. Construction began in spring 2007 with completion scheduled for November 2010, but the joint venture team of Flatiron and United Contractors expects to finish construction sooner. The bridge-building "machine" Flatiron/United used was actually an overhead launching gantry that cantilevered out from the end of the newly constructed bridge and permitted pile driving and other construction to proceed from the top down. The team used two of the patented launching gantries to build the 3-mile-long (4.8-kilometer-long) bridge over the river. One of the 550-foot-long (167.6-meter-long) gantries worked from the north end of the twin bridges and the other approached from the south, working north, said Bill Kincannon, resident engineer for the North Carolina DOT. When the two headings met in the middle, the structure was complete. "The launching gantries allowed us to construct a bridge over environmentally sensitive wetlands without the need for a work trestle," said Michael Robinson, state bridge construction engineer for the North Carolina DOT. He said permitting agencies, including the U.S. Army Corps of Engineers, would have allowed a work trestle, or temporary bridge, to be built beside the permanent bridge. "However, when we selected a design-build contractor, this top-down method gave Flatiron/United an advantage over contractors that would have used a more conventional method of construction," said Robinson. "With this method, the new piles are the only thing to touch the wetlands as bridge construction proceeds." The new bridge features precast concrete hollow piles, precast match-cast segmental pier caps, precast concrete girders with 120-foot (36.5-meter) spans and a cast-in-place deck with steel stay-in-place forms. Each launching gantry stretched more than three bridge spans in length and was supported by the structure recently built below. 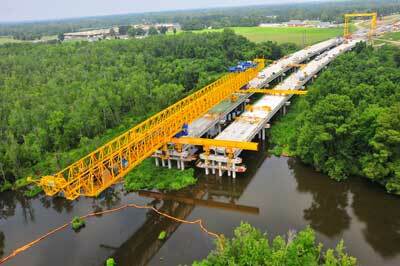 Up to three spans were constructed concurrently with each launching gantry. "The gantries are capable of handling and erecting all the necessary precast bridge components," said Dan Martinson, a cost engineer and scheduler for Flatiron. "They could do everything from handling and driving the piles to setting the pier caps and erecting the girders." Although the last components of the Tar River bridge structure were set by September 2009, miscellaneous work remained to complete the project. This included slipforming the rest of the bridge parapet, installing the decorative metal rail, placing the final layer of asphalt on the roadway, and completing the pavement markings and project signage. For more information on the project, visit www.ncdot.gov/projects/us17bypass. Warm-mix asphalt, a group of technologies that allow asphalt pavement mixes to be produced and placed on the road at lower temperatures, is showing promise as a way to save energy and improve air quality. Brought from Europe in 2002, WMA is drawing growing attention from the U.S. highway community. Among its benefits is reducing the amount of fuel needed to heat traditional hot-mix asphalt to 300 to 350 °F (149 to 177 °C) to enable the asphalt binder to coat the aggregate. WMA technologies use two basic methods to lower production temperatures: a small quantity of water is added to create foaming of the asphalt, or chemical or organic additives are introduced. Some of the technologies work by reducing the viscosity of asphalt and providing for the complete coating of aggregates at lower temperatures–35 to 100 °F (2 to 38 °C) below typical HMA production temperatures. FHWA's Central Federal Lands Highway Division applied WMA on a road in Yellowstone National Park in Wyoming in 2007. Benefits included a 20 percent savings on fuel costs at the asphalt plant. By cutting fuel use through lower production temperatures, WMA reduces emissions, which could make it an alternative paving choice for projects in areas with air quality restrictions. The lower fuel requirements to produce the mix also could cut project costs. Other WMA benefits include the ability to pave in cooler temperatures, haul mixes longer distances while maintaining their workability and compact mixes with less effort. 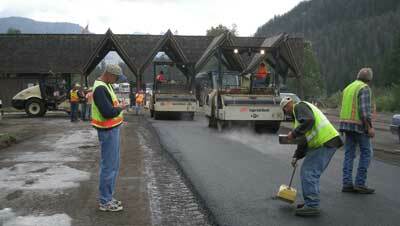 WMA also improves working conditions for paving crews, reducing their exposure to asphalt fumes. For WMA to succeed in the United States, however, "we need to make sure we're getting equal to, if not better, performance than with HMA," said Matthew Corrigan, Federal Highway Administration pavement engineer. "We need to continue our focus on performance and protecting the taxpayers' investment." Although relatively new to the United States, WMA has been used in Europe for years. In 2002, the National Asphalt Pavement Association studied WMA applications in several European countries. Five years later, a team of U.S. materials experts visited Belgium, France, Germany and Norway to evaluate WMA technologies through FHWA's International Technology Scanning Program. The scan team learned that WMA has been used in all types of asphalt pavement, including dense-graded, stone matrix, porous and mastic asphalt. It also has been used in a range of pavement layer thicknesses, and sections have been constructed on roadways with a variety of traffic levels. European highway agencies reported that they expect WMA's long-term performance to be the same as or better than that of HMA. Representatives of the public and private sectors—including FHWA, the National Asphalt Pavement Association and state highway agencies—formed the Warm-Mix Asphalt Technical Working Group to evaluate WMA technologies and implement technical guidance for U.S. use. Group initiatives include collecting WMA specifications and documenting WMA projects around the country, said Corrigan, group co-chair. "This will give us a better picture of the implementation of WMA," he said. About 40 state highway agencies have tried WMA on projects and about 15 have developed specifications for its use. "Texas is the leader in WMA tons produced," Corrigan said. The group also is pursuing a program to evaluate mix technologies on a national level through the American Association of State Highway and Transportation Officials' National Transportation Product Evaluation Program. The Warm-Mix Asphalt Technical Working Group's site at http://www.warmmixasphalt.org/ is the "one-stop shop for all things warm-mix asphalt," said Corrigan. It features information on WMA technologies and links to publications, presentations and user guidelines. FHWA's site at www.fhwa.dot.gov/pavement/pub_details.cfm?id=563 has details on WMA technologies and research. To download the scan report Warm-Mix Asphalt: European Practice (FHWA-PL-08 007), visit www.international.fhwa.dot.gov/links/pub_details.cfm?id=563. For more information, contact Matthew Corrigan at (202) 366-1549 or matthew.corrigan@dot.gov.